Outline the concept and characteristics of systems. System: Assemblage of parts and relationships between them, which together make up a whole. The components are connected together through the transfer of energy and matter, with all parts linking and effecting eachother. Apply the systems concept on a range of scales. There are different scales of systems; there can be small-scale local ecosystem, large ecosystem as a biome, and global ecosystems. For example: Forests contain many small-scale ecosystems. Define the terms open system, closed system and isolated system. Open: exchanges matter and energy between the system. They are organic and must interact with environment to obtain new matter and energy. Ex: People are open systems. Closed: exchanges energy but not matter. Ex: the earth can be seen as a closed system. Describe how the first and second laws of thermodynamics are relevant to environmental systems. Explain the nature of equilibria. Is the common property of most open systems in nature. There is a tendency in natural systems for the equilibrium to return after the disturbances, but some systems (succession) may go through long-term changes to keep their equilibrium while keeping their integrity. Open systems have steady-state equilibrium, where any change to a stable system returns to the original equilibrium after the disturbance. Stable changes then goes back to the normal state. Unstable changes and does not go back to the normal state. Define and explain the principles of positive and negative feedback. Negative feedback: tends to damp down, neutralize or counteract any deviation from an equilibrium, and promotes stability. Positive feedback: increases change in a system and deviation away from a equilibrium. A system may include both feedbacks. Describe transfer and transformation processes. Both material and energy move or flow throw ecosystems. Transfers: normally flow through a system and involve a change in location. When the flow does not involve a change in form just location. Ex: Material through biomass, and energy movement. Transformations: lead to an interaction within a system in the formation of a new and product, or involve a change of state. A flow involving a change in form. Ex: Matter and energy transformations, energy to matter transformations. 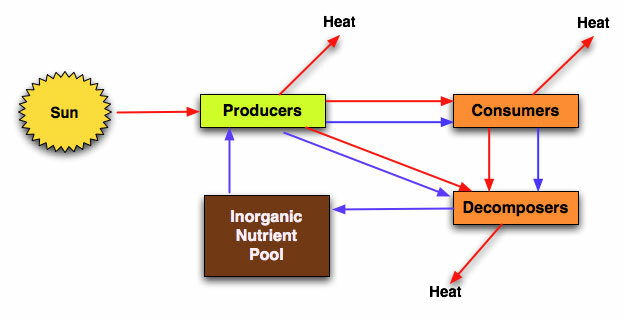 Inputs and outputs from systems are called flows and represented by arrows in system diagrams. The stock held within a system is called the storage and is represented through boxes. Construct and analyse quantitative models involving flows and storages in a system. Evaluate the strengths and limitations of models. inputs can be changed and outcomes examined without having to wait for real events.